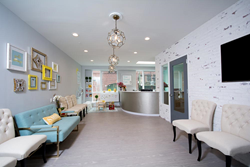 Dr. Cohen of Pediatric Dentistry in Jersey City, NJ is now accepting new patients and offers Silver Diamine Fluoride (SDF) as an alternative cavity treatment for children. Silver Diamine Fluoride (SDF) provides a safe and non-invasive way to stop cavities from progressing. Dr. Cohen of Pediatric Dentistry in Jersey City is now offers Silver Diamine Fluoride (SDF) as safe and non-invasive way to stop cavities from progressing. Dubbed as a “magic bullet” for cavities in kids, SDF has been recently approved in US. The importance of good preventative dental care from a very early age has become increasingly recognized over the past few years, with more clinical studies linking poor oral health to poor general health. The standard of pediatric dental care given to a young patient can shape their dental health and their attitude towards professional dental care for life. This is something top-rated pediatric dentist Dr. Mila Cohen understands all too well. It is this dedicated dentist’s mission to ensure every child visiting her practice receives the very best level of dental care available today. When a child has a negative experience at the dentist, it can easily create fears and phobias that will last for life. Often many adults struggling with poor dental health will have failed to seek treatment because of these childhood experiences. Dr. Cohen’s approach towards helping nervous children is to work with them and their parents, and she has extensive and specialized skills to help a child feel that dental visits are fun and enriching, rather than something to be feared. By building a relationship with a child and their parent, Dr. Cohen can ensure every visit is a positive experience. As the best rated pediatric dentist in Jersey City, NJ, Dr. Cohen is focused on providing the best and most advanced treatments to help protect young teeth. This includes the use of silver diamine fluoride (SDF) where appropriate. This treatment is regarded as being a “magic bullet” for preventing and treating early signs of cavities in children’s teeth and has already been in use for many years in Europe and Asia. SDF was recently approved for use in the United States and is a safe and non-invasive way to prevent cavities from worsening. “The silver in this treatment has anti-microbial properties,” explains Dr. Cohen, “killing bacteria and preventing regrowth.” Dr. Cohen is extremely keen on preventing dental problems as this approach helps avoid a very young child from needing a dental filling, especially as some children find treatment very hard to cope with. Dr. Cohen’s pediatric dental practice is equipped with the latest scanning equipment. Using the most advanced diagnostic technology helps to safely detect small problems in children’s teeth while ensuring they are not exposed to unnecessarily high levels of radiation. This equipment includes digital dental x-rays that produce high-quality images which are instantly displayed on-screen. These images allow Dr. Cohen to diagnose and provide the most appropriate treatment more quickly which is essential if a child is in any discomfort. When needed, Dr. Cohen will use the most advanced 3D scanning equipment available in the United States and this provides valuable diagnostic information needed when planning more sophisticated treatments such as orthodontics. This up-to-date technology reduces radiation exposure by more than 77%. An experienced pediatric dentist, Dr. Cohen regularly contributes to well-respected news outlets and to the latest research. She is also involved in providing guidance on important topics within pediatric dentistry including prevention and treatment of childhood dental diseases. Dr. Mila Cohen is a Board Certified Pediatric Dentist and is a member of various academies which include the American Academy of Pediatric dentistry, American Dental Association, and NJ Academy of Pediatric Dentistry. A nationally recognized pediatric dentist, Dr. Cohen believes in using a gentle and compassionate touch when treating children. All staff members at the practice have the same caring attitude and go out their way to help young patients feel comfortable.